Last week, close to 200 women from across Bougainville participated in the Bougainville Women Human Rights Defenders (WHRDs) Forum (15 – 19 October 2018), coordinated by Nazareth Centre for Rehabilitation (NCfR) in partnership with International Women’s Development Agency (IWDA). 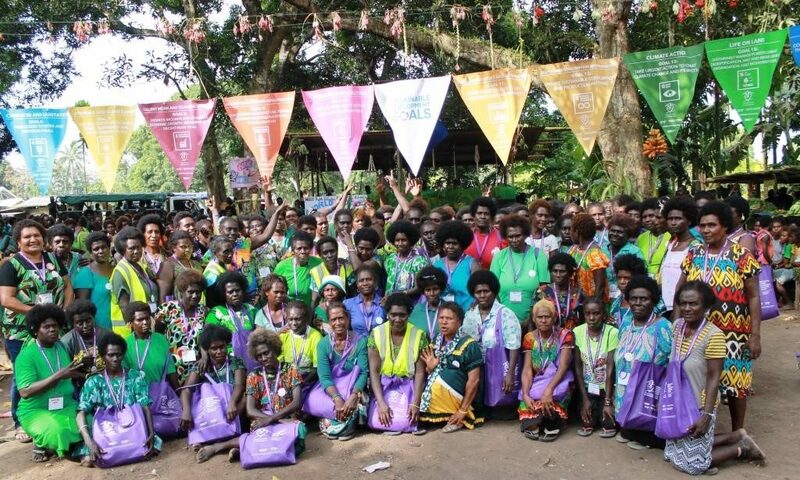 The 2018 Forum was unique, travelling across several locations in North Bougainville where events were hosted by WHRDs groups in Siara, Sanakova, Haku and Malasang wards over the first three days, and observed by thousands of community members. Opening of the Bougainville WHRDs Forum. From left: Regional Member the Hon. Joe Lera, IWDA Program Manager PNG Elena Leddra, Honourable Chief Dr John Momis, President of the Autonomous Region of Bougainville, NCfR Advocacy Coordinator Agnes Titus, and Constituency Member the Hon. Joseph Watawi, 15 October 2018. Photo credit: Cathy Fokes/IWDA. The Forum enabled participants to build connections, strengthen networks and referral pathways in order to better protect and defend women’s and children’s rights. It was the first time for women to experience a travelling forum that provided both the opportunity to learn from each other, and share with other WHRDs groups, national and international organisations and partners, particularly for the large number of young women attending. 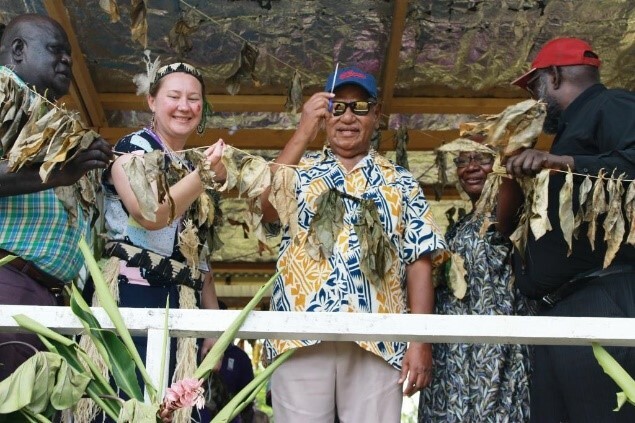 Four representatives from a women’s organisation called Voice for Change, the networking partner of NCfR, came to Bougainville from Jiwaka Province, PNG. The focus of discussions was on issues of family and sexual violence, community safety and security, poverty reduction, leadership, recognition of work by WHRDs and their roles in the communities, sexual and reproductive health and rights, access to education and services, requests for the need for a Bougainville Safe Houses Policy, need for improved infrastructure for rural women, especially those living in remote areas, gender equality, sharing examples of working with male advocates and men from communities to advance gender equality, concerns about mining impact on local communities, need for action on climate change, and many other important issues for the women of Bougainville. The Forum also provided women with economic opportunities through selling their arts and crafts, food baskets and produce. Several organisations were invited to participate to share information with women leaders on critical topics, including from the Law and Justice Sector who discussed the Family Protection Act (FPA), stating that Village Magistrates have the power to issue Interim Protection Orders, encouraging women to access justice through the court system. The FPA criminalises family and sexual violence, with these matters no longer considered a family issue. The final two days of the program, held in Hahela, Buka district, provided participants with the opportunity to discuss successes and challenges of their roles as Women Human Rights Defenders and plan the year ahead toward their contribution for building a peaceful and safer Bougainville. Key highlights included a dialogue with high level Autonomous Region of Bougainville representatives and WHRDs. The Honourable Chief Dr John Momis, President of the Autonomous Region of Bougainville led the ABG representative dialogue, communicating information about the upcoming 2019 Bougainville Referendum. Selected district WHRDs representatives were then able to raise their concerns directly to government officials before the dialogue was opened to take questions from other Forum participants. The women raised several critical issues including poverty, peace and security issues, access to trauma counselling, education, health and other public services gaps before asking how the ABG could support the work of WHRDs. The President Momis concluded the dialogue with a message encouraging unity and solidarity amongst women and the people of Bougainville. The Bougainville Women Human Right Defenders act as educators, advocates, counsellors and activists in their communities, trying to change harmful practices and beliefs to make communities safer for women and girls. Together the women shared amongst each other their stories of courage and persistence, success and innovative approaches to working with communities. A key component identified for the success of WHRDs and their work, was in the level of support they received from their families. Many women from across age groups talked about the recognition and encouragement they had received from close family members. Bougainville Women Human Rights Defenders celebrating World Food Day at Sanakova village, Selau constituency, North Bougainville, 16 October 2018. Photo credit: Cathy Fokes/ IWDA. The week long program ended with the official launch of the second phase of Nazareth Centre for Rehabilitation’s ‘From Gender Based Violence to Gender Justice and Healing’ project, supported by the Australian Government in partnership with the Government of Papua New Guinea as part of the Pacific Women Shaping Pacific Development program. The following invited guests form international partners attended the last two days of the program to witness the success of the project and the forum: Angelyn Amos, Program Manager (Gender), Australian High Commission PNG, Richelle Tickle, PNG Country Manager Pacific Women Support Unit, and Bettina Baldeschi, CEO IWDA. The Forum then concluded with a celebration amongst the WHRDs and spirit of readiness to continue the important work they provide to their communities to respond and support women and their children who experience threats and actual violence, including sorcery accusations related violence and family, sexual and gender-based violence.